Hadrons, the particles made of quarks, are almost unanimously produced in the two or three quark varieties in particle colliders. However, in the last decade or so, a new frontier has opened up in subatomic physics. Four-quark particles have begun to be observed, the most recent being announced last Thursday by a collaboration at Fermilab. These rare, fleetingly lived particles have the potential to shed some light on the Strong nuclear force and how it shapes our world. The discovery of a new subatomic particle was announced last Thursday by the DØ (DZero) collaboration at Fermilab in Chicago. DØ researchers analysed data from the Tevatron, a proton-antiproton collider based at Fermilab. The new found particle sports the catchy name “X(5568)” (It’s labelled by the observed mass of 5,568 Megaelectron-volts or MeV. That’s about six times heavier than a proton.) X(5568) is a form of “tetraquark”, a rarer variety of the particles known as hadrons. Tetraquarks consist of two quarks and two antiquarks (rather than the usual three quarks or quark-antiquark pairs that make up hadrons particle physicists are familiar with). While similar tetraquark particles have been observed before, the new addition breaks the mould by consisting of four quarks of totally different flavours: bottom, strange, up and down. The particle’s decay is best explained Strong force, aptly named since it’s the strongest known force in the universe, which also acts to hold quarks together in more stable configurations such as inside the proton. The Strong force is described by a theory known as Quantum Chromodynamics (QCD for short), a crucial part of the Standard Model of particle physics. The properties of X(5568) will provide precision tests of the Standard Model, as well as improving our understanding of the nature of Confinement. This is a dimly understood process by which quarks are bound up together to form the particles (such as protons) that make up most of the visible matter in the universe. Quarks are defined by the strong force, being the only particles known to physics that interact via QCD. They were originally conceived of in 1964 by two of the early pioneers of particle physics Murray Gell-Mann and George Zweig, who posited the idea of “quarks” to explain the properties of a plethora of particles that were discovered in the mid-twentieth century. 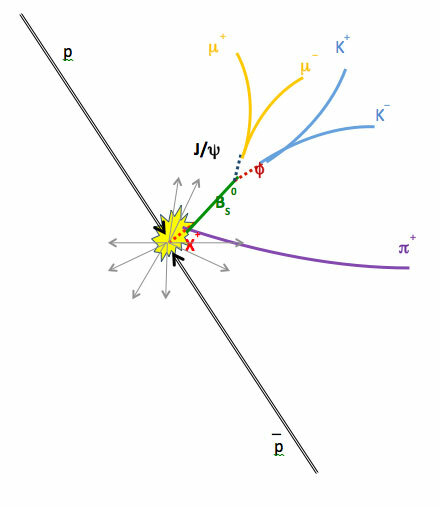 After a series of experiments in the late ‘60s and ‘70s, the evidence in favour of the quark hypothesis grew much stronger and it was accepted that many of the particles that interacted and decayed very quickly (due to the magnitude of the strong force) in detectors were in fact made up of these quarks, which are now known to come in six different varieties known as “flavours”. A more precise model of the strong force, which came to be known as QCD, was also verified in such experiments. 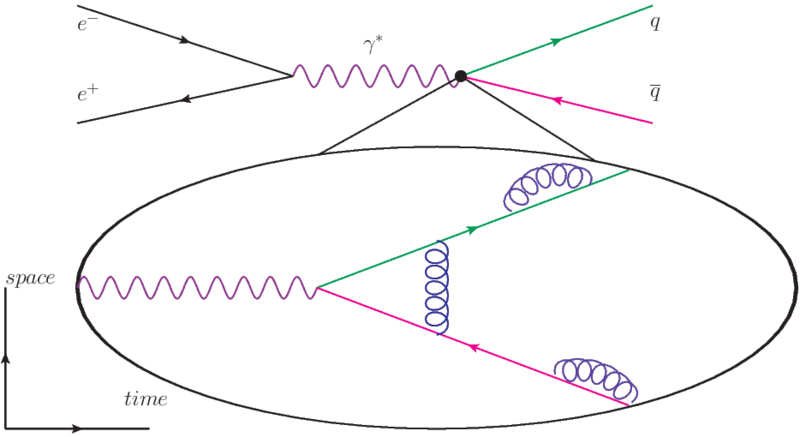 QCD is a very difficult theory to draw predictions from because unlike electromagnetism (the force responsible for holding atoms together and transmitting light between objects), the “force carriers” of QCD known as gluons are self-interacting. Whereas light, or photons, simply pass through one another, gluons pull on one another and quarks in complex ways that give rise to the phenomenon of confinement: quarks are never observed in isolation, only as part of a group of other quarks/antiquarks. These groups of quarks and anti-quarks are what we call Hadrons (hence the name Large Hadron Collider). This self interaction arises from the fact that, unlike light which simply couples to positive or negative charges, QCD has a more complicated structure based on three charges labelled as Red, Green and Blue (which confusingly, have nothing to do with real colours, but are instead based on a mathematical symmetry known as SU(3)). The hadrons discovered in the twentieth century tended to come in pairs of three quarks or quark-antiquark pairs. Although we now know there is nothing in the theory of QCD that suggests you can’t have particles consisting of four, or even five quarks/antiquarks, such particles were never observed, and in fact even some of the finest minds in theoretical physics (Edward Witten and Sidney Coleman) once thought that QCD would not permit such particles to exist. Like clovers, however, although the fourfold or even fivefold variety would be much rarer to come by it turns out such states did, in fact, exist and could be observed. The first hints of the existence of tetraquarks were at the Belle experiment, Japan in 2003, with the observation of a state called X(3872) (again, labelled by its mass of 3872 MeV). One of the most plausible explanations for this anomalous resonance was a tetraquark model, which in 2013, an analysis by the LHCb experiment at CERN found to be a compatible explanation of the same resonance found in their detector. 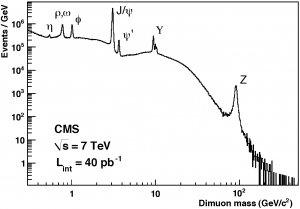 The same year, Belle and the BESIII experiment in China both found a resonance with the same characteristics, labelled Zc(3900), which is now believed to be the first independently, experimentally observed tetraquark. 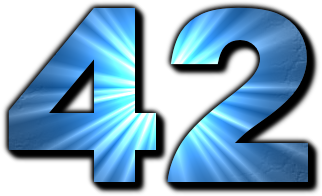 The most recent evidence for the existence of tetraquarks, prior to last Thursday’s announcement, was found by the LHCb experiment in 2014, the Z(4430). This verified an earlier result from Belle in 2007, with an astonishingly high statistical significance of 13.9σ (for comparison, one typically claims a discovery with a significance of 5σ). LHCb would also go on, unexpectedly, to find a pentaquark (four quarks and an antiquark) state in 2015, which could provide a greater understanding of QCD and even a window into the study of neutron stars. Z(4430) was discovered from the analysis of its decay into mesons (hadrons consisting of quark-antiquark pairs), specifically the ψ’ and π– mesons from the decay B0 → K + ψ’ π–. In the analysis of the B0 decay, it was found that the Z(4430) was needed as an intermediate particle state to explain the resonant behaviour of the ψ’ and π–. The LHCb detector, whose asymmetric design and high resolution makes it particularly well suited for the job, reconstructs these mesons and looks at their kinematic properties to determine the shape and properties of the resonance, which were found to be consistent with a tetraquark model. The recent discovery of X(5568) by the DØ collaboration involved a similar reconstruction from Bs and π– mesons, which was used to infer its quark flavour structure (b, s, u, d, though which two are the particles and which two are the antiparticles remains to be determined). X(5568) is found to have a large width (22 MeV) in the distribution of its decays, implying that it decays very quickly, best explained by QCD. 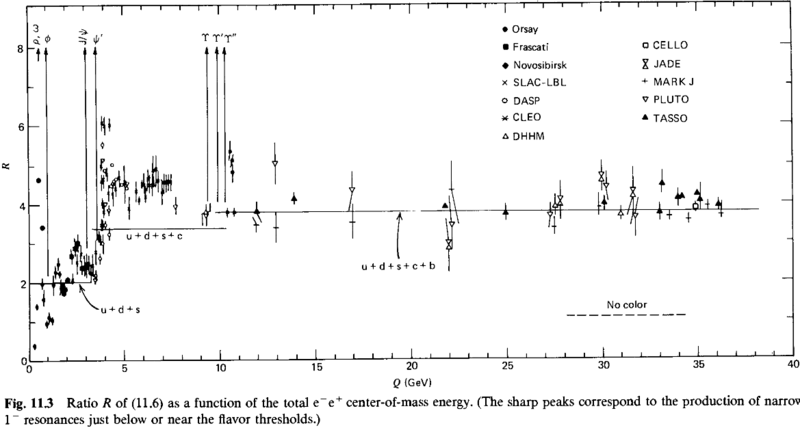 Since quarks cannot change flavours in QCD interactions (while they can do so in weak nuclear interactions), this is what allowed DØ to determine its quark content. The other properties of this anomalous particle, such as its mass and its lack of spin (i.e. S = 0) are measured from the kinematics of the mesons it produces, and can help increase our understanding of how QCD combines the quarks in such an unfamiliar arrangement. One of the long-standing controversies surrounding tetraquark states is whether the states are truly a joint four particle state or in fact a sort of molecule of two strongly bound mesons, which although they form a bound state of four particles in total, is actually analogous to two separate atoms in a molecule rather than a single, heavy atom. The analysis from DØ, based on X(5568)’s mass seems to imply that it’s the former, a single particle of four quarks tightly bound in an exotic hadron, though the jury is still out on the matter. DØ’s discovery is based on an analysis of the historic data collected from the Tevatron from the 28 years it was operating, since the collider itself ceased operation 2011. Despite LHCb having found tetraquark candidates in the past and being suited to finding such a particle again, it has not yet independently verified the existence of X(5568). LHCb will now review their own data as well as future data that will recommence being collected later this year, to see if they too observe this unprecedented result and hopefully improve our understanding of its properties and whether they are consistent with the Standard Model. This is definitely a result to look out for later this year and should shed some light on one of the fundamental forces of nature and how it acts to create the particles, such as protons, that make up the world around us. That is, the dimensionless coupling of the force carrier particle interactions is greater than electromagnetism and the weak nuclear force, both of which in turn are stronger than gravity (consider how a tiny magnet can lift a paper clip against the gravity of the entire Earth). 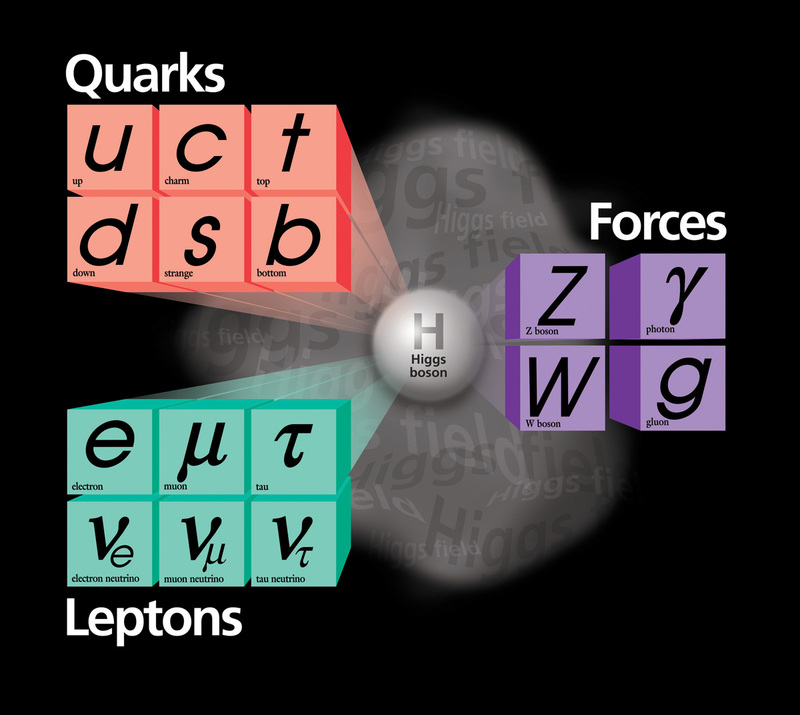 Many theories of Beyond the Standard Model physics predict new forces, and it may turn out that all the forces are unified into a single entity at high energies. For an excellent summary of the history of quarks and some of the motivations behind the quark model, check out this fantastic documentary featuring none other than the Nobel Prize wining physicists, Richard Feynman and Murray Gell-Mann themselves. Particles are discovered by the bumps or resonances they leave in the statistical distributions of particle decays/scattering events. 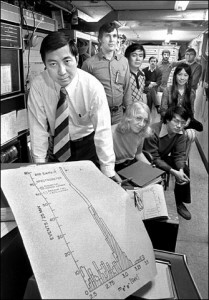 See for example, one of the excesses of events that led to the discovery of the Higgs Boson. In the late 1980s, as particle colliders probed deeper into the building blocks of nature, there were hints of a strange and paradoxical behaviour in the heart of atoms. Fundamental particles have a curious quantum mechanical property known as “spin”, which the electron carries in magnitude ½. While the description of electron’s spin is fairly simple, protons are made up of many particles whose “spins” can add together in complicated ways and yet remarkably, its total spin turns out to be the same as the electron: ½. This led to one of the great mysteries of modern physics: how do all the particles inside the proton conspire together to give it a ½ spin? And what might this mean for our understanding of hadrons, the particles that make up most of the visible universe? We’ve known about the proton’s existence for nearly a hundred years, so you’d be forgiven for thinking that we knew all there was to know about it. For many of us, our last exposure to the word “proton” was in high school chemistry, where they were described as a little sphere of positive charge that clumps with neutrons to make atomic nuclei, around which negatively charged electrons orbit to create all the atoms, which make up Life, the Universe and Everything1. 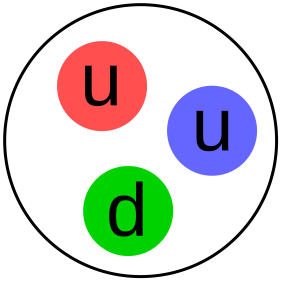 The simple, three-quark model of a proton (each coloured circle is a type of “quark”). Like many ideas in science, this is a simplified model that serves as a good introduction to a topic, but skips over the gory details and the bizarre, underlying reality of nature. In this article, we’ll focus on one particular aspect, the quantum mechanical “spin” of the proton. The quest to measure its origin has sparked discovery, controversy and speculation that has lasted 30 years, the answer to which is currently being sought at a unique particle collider in New York. The first thing to note is that protons, unlike electrons2, are composite particles, made up from lots of other particles. The usual description is that the proton is made up of three smaller “quarks” which, as far as we know, can’t be broken down any further. This picture works remarkably well at low energies but it turns out at very high energies, like those being reached at the at the LHC, this description turns out to be inadequate. At that point, we have to get into the nitty-gritty and consider things like quark-antiquark pairs that live inside the proton interacting dynamically with other quarks without changing its overall charge. Furthermore, there are particles called gluons that are exchanged between quarks, making them “stick” together in the proton and playing a crucial role in providing an accurate description for particle physics experiments. A more detailed model of the proton. 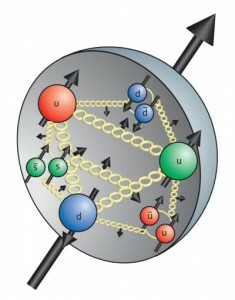 The golden chains between the quarks (the coloured spheres) are representations of gluons, transferred between them. 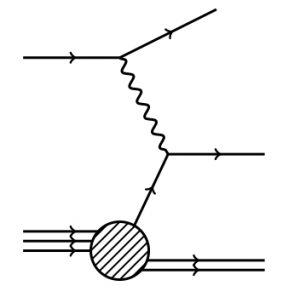 Quark anti-quark pairs are also visible with arrows representing spins. That’s the proton, but what exactly is spin? It’s often compared to angular momentum, like the objects in our everyday experience might have. Everyone who’s ever messed around on an office chair knows that once you get spun around in one, it often takes you a bit of effort to stop because the angular momentum you’ve built up keeps you going. If you did this a lot, you might have noticed that if you started spinning with your legs/arms outstretched and brought them inwards while you were spinning, you’d begin to spin faster! This is because angular momentum (L) is proportional to the radial (r) distribution of matter (i.e. 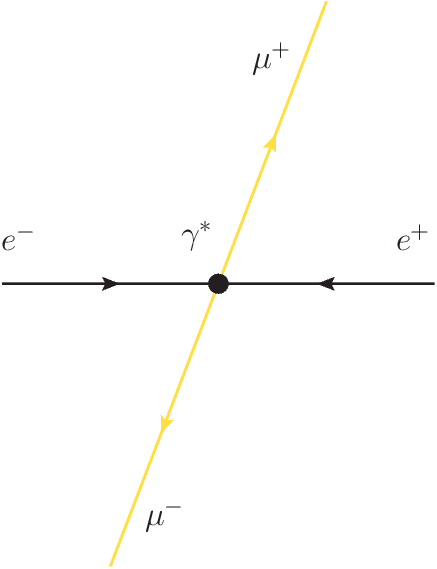 how far out things are from the axis of rotation) multiplied by the speed of rotation3 (v). To put it mathematically L = m × v × r where m is just your constant mass. Since L is constant, as you decrease r (by bringing your arms/legs inwards), v (the speed at which you’re spinning) increases to compensate. All fairly simple stuff. Both L and S can only take on discrete values at the microscopic level, that is, they have quantised values. But whereas a point-like particle cannot have L > 0 in its rest frame (since if it isn’t moving around and v = 0, then L = 0), S will have a non-zero value even when the particle isn’t moving. S is what we call Spin. For the electron and quarks, it takes on the value of ½ in natural units. Focus on one of the red faces. When the cube rotates every 360 degrees, the red ribbon appears to go above and below the cube alternatively! Because the cube is coupled to its environment, it takes 720 degrees to return it to it’s original orientation. Spin is an important property of matter that only really manifests on the quantum scale, and while we can’t visualise it, it ends up being important for the structure of atoms and how all solid objects obtain the properties they do. The other important property it has is that the spin of a free particle likes to align with magnetic fields4 (and the bigger the spin, the greater the magnetic coupling to the field). By using this property, it was discovered that the proton also had angular momentum J = ½. Since the proton is a stable particle, it was modelled to be in a low energy state with L = 0 and hence J = S = ½ (that is to say, the orbital angular momentum is assumed to be zero and hence we may simply call J, the “spin”). The fact the proton has spin and that spin aligns with magnetic fields, is a crucial element to what makes MRI machines work. In truth, the total opposite happened. Although the experiments had a reasonable amount of uncertainty due to the inherent difficulty of polarising protons, a landmark paper by the European Muon Collaboration found results consistent with the quarks contributing absolutely no overall spin to the proton whatsoever! The measurements could be interpreted with the overall spin from the quarks being zero5. This was a complete shock to most physicists who were expecting verification from what was supposed to be a fairly straightforward measurement. Credit where it is due, there were theorists who had predicted that the assumption about orbital angular momentum (L = 0) had been rather ad-hoc and that L > 0 could account for some of the missing spin. Scarcely anyone would have expected, however, that the quarks would carry so little of the spin. Although the nuclear strong force, which governs how quarks and gluons combine to form the proton, has been tested to remarkable accuracy, the nature of its self-interaction makes it incredibly difficult to draw predictions from. 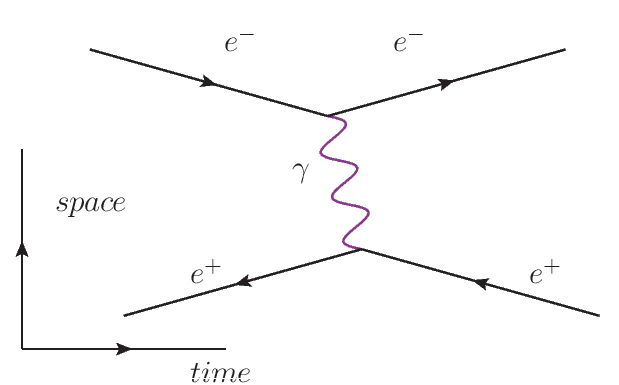 The Feynman diagram for Deep Inelastic Scattering (electron line at the top, proton on the bottom, with a photon exchanged between them). This type of scattering is sensitive to quark spin. Future experiments (led by father and son rivals, Vernon and Emlyn Hughes6 of CERN and SLAC respectively) managed to bring this to a marginally less shocking proposal. The greater accuracy of the measurements from these collaborations had found that the total spin contributions from the quarks was actually closer to ~30%. An important discovery was that the sea quarks, thought not to be important, were actually found to have measurable polarisation. Although it cleared up some of the discrepancy, it still left 60-70% of spin unaccounted for. Today, following much more experimental activity in Deep Inelastic Scattering and precision low-energy elastic scattering, the situation has not changed in terms of the raw numbers. 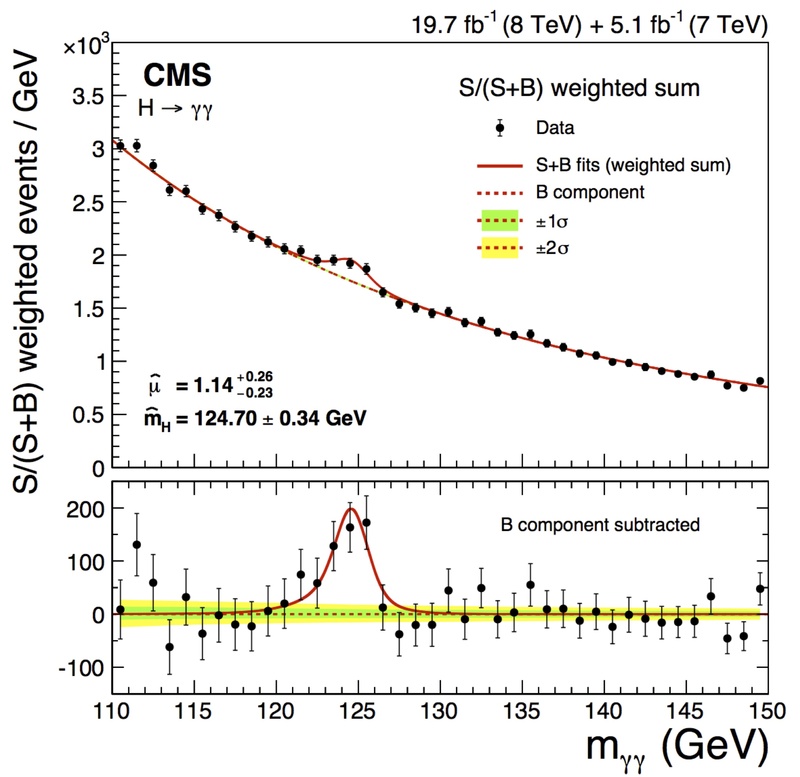 The best estimates still peg the quarks’ spin as constituting only about 30% of the total. 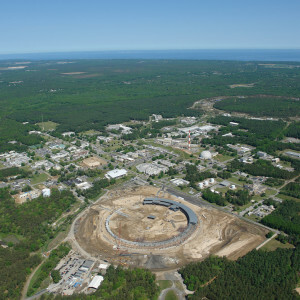 The Brookhaven National Laboratory where RHIC is based (seen as the circle, top right). The Relativistic Heavy Ion Collider (RHIC) in New York is currently the only spin-polarised proton collider in the world. This gives it a unique sensitivity to the spin structure of the proton. In 2014, an analysis of the data collected at RHIC indicated that the gluons (whose spin contribution can be inferred from polarised proton-proton collisions) could potentially account for up to 30 of the missing 70% of proton spin! About the same as the quarks. This would bring the “missing” amount down to about 40%, which could be accounted for by the unmeasurable orbital angular momentum of both quarks and gluons.